Turkey. Not to be confused with “Lamb”, another SIFF movie. There is a style of movie making where we meet some people, and rotten things happen to them, and then another rotten thing happens, and then they do something, but it makes something rotten happen. And just when you think something has to go right, another rotten thing happens. And we will sit through the whole movie waiting for some good thing that seems like it just has to occur. Usually it does not. At about the point where Marion and I both thought it was time for a good thing to happen, it didn’t. We don’t have to have a discussion, we basically have the same thought at the same time, and exchange a look, its kind of cool. So we left. Rereading the siff blurb, I think maybe we should have stuck it out, and good things did start to happen. If so, we probably would have liked the movie. Set in a fairly traditional Turkish village. The kid pictured above is a good reason to see this movie. 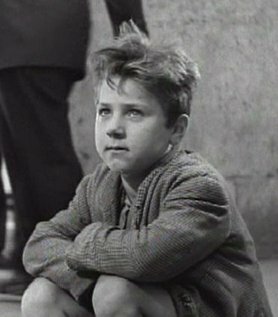 He reminds me a little of the kid in The Bicycle Thief. One of the great movie performances ever, in one of the 10 best movies ever made. His real name is Enzo Staiola. He’s 76 now. Still with us. He ended up being a math teacher.